Who doesn't love giving or getting the perfect present? So what makes a present fabulous? After some serious pondering, MindfulEats decided that the best gifts are 1) adored by the receiver, 2) actually used by the recipient instead of adding clutter to their house, 3) last forever - physically or in memory, 4) help to make the world and/or the person just a little better. 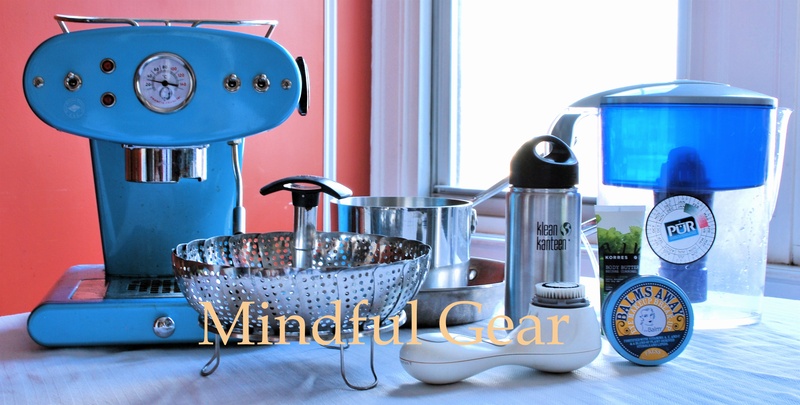 For those of you that like visuals - you can go straight to Mindful Gear. If you don't mind reading, here's our gift list. Remember those popcorn buckets with three flavors that you would get as a kid? Well, Pop Karma has updated the tin with irresistible organic popcorn that is made from top quality, sustainable ingredients. Since it's my company, I am mindful in terms of the ingredients and the ethics, and try to be as good as possible. A healthy snack that spreads happiness. Yum. Stainless steel water bottles keep you hydrated, don't leach and reduce the use of plastic. We found the most attractive bottle around - architectural, sleek and wide-mouthed so it's easy to clean and you can see inside. If you want to keep your drinks cold or hot, here's an insulated version. Add a cafe lid so you can drink while you go. It's old fashioned, but there's no better conveyer of news that the newspaper. You can't help but read intriguing bits you would have never read online while you flip through the pages. And your local paper provides community news you won't find anywhere else. Want to feed a developing mind? There's nothing like the New York Times. Newspaper is also one of the most recycled items - it was 88% back in 2006! My parents gave me a set of All-Clad cookware for Christmas one year. It made cooking much more fun. I cook more often since receiving it, and it's still gorgeous years later. I can't imagine ever needing to replace it. This All-Clad set has the basics that will keep you covered - a 10" and 12" frying pan, a 4 qt. sauce pan with lid, a 4 qt. saute pan with lid, a 2 qt. saucier pan with lid and an 8 qt. stock pot for soup and pasta. Bar Keeper's Friend keeps it all clean and shiny as new. I was always skeptical of expensive knives - were they really better than normal knives that cut just fine? I splashed out on a Shun Santoku knife, and it took cooking to a whole new level. The super-sharp blade was a dream and sped up my nonexistent knife skills. The santoku works on nearly everything - meat AND vegetables. Stock the cook in your life with fresh local food - find a local CSA and get your foodie a share. Now you've stocked up with all the right equipment, make sure you've got the recipes. The New Basics Cookbook is an old classic that tells you how to cook everything, in a straightforward and easygoing way. Is the whole idea of getting regular dinners on the table overwhelming? Saving Dinner will e-mail an easy weekly meal plan complete with recipes and shopping lists. You can choose all kinds of menus according to your needs like regular, low-carb, or heart healthy. It's $15 for a 3 month subscription of $47 for the year. After all that cooking, put leftovers in these nifty glass keepers. Plastic will eventually leach - glass is a bit heavier, but you can take it to work for lunch too. End your meal or begin your day with a lovely cappuccino. This FrancisFrancis expresso machine is by far the most elegant and stylish item in my kitchen, and it makes great espresso. I'm addicted! Has someone in your life decided they want to be healthier? Help them on their journey! If you're comfortable exercising, create a certificate for your pal and give them a few "private training" sessions with you. Show them how to work some weights at the gym. Show them a few routes for walks, intro runs or bike rides. Buy them a gym membership, yoga classes or private training sessions. Interested in eating raw, or the benefits of juicing? This Breville juicer does quick work of vegetables and has lasted me for years. Toxins in personal products is so gross. Lighten up with Juice Beauty Organic Facial Wash that's so divine smelling you'll want to eat it. Moisturize your elephant hide with thick Korres Butter, natural and without an overpowering scent. After a day and night of making eyes, erase all the make-up with gentle The Balm. Hands-down, this is one of the best beauty products out there. After I started using it facialists told me I didn't need facials. The Clarisonic Skincare brush is expensive but worth every penny. Kids are particularly susceptible to chemicals - give the toddler in your life a stainless steel sippy cup. Kids love special friends. Make sure their dolls are nontoxic and kind to the earth. The Earth Friends are made from all organic or recycled materials and come in diverse styles. They hark back to the old days before kids wore belly shirts and pants around their knees. Get 20% off by using the code "nyfoods". If you stop learning you die. Feed your friend's intellect with a class. What are they interested in? A language class, a cooking class, a wine class, flower arrangement... the world is endlessly interesting. Give the discerning bon vivant in your life a local craft beer, whisky or wine. If you don't live in the different area, bring them your local brew. You'll be unique and brilliant. Need a hostess gift? Everyone brings a bottle of wine. Pick up something fresh from the Farmer's Market. Be different with local cheese or pastured eggs wrapped with a pretty bow. Schoolhouse Kitchen makes lovely gift foods. There are also unique pickles from Rick's Picks, and there are an increasing number of local pickle makers. For the commuter that wants some exercise, a bike is the perfect gift! Want to learn more about your gifts?